To overcome this you can use a so called autodiscoverredirect mechanism. This hasn’t changed much in Exchange 2013. 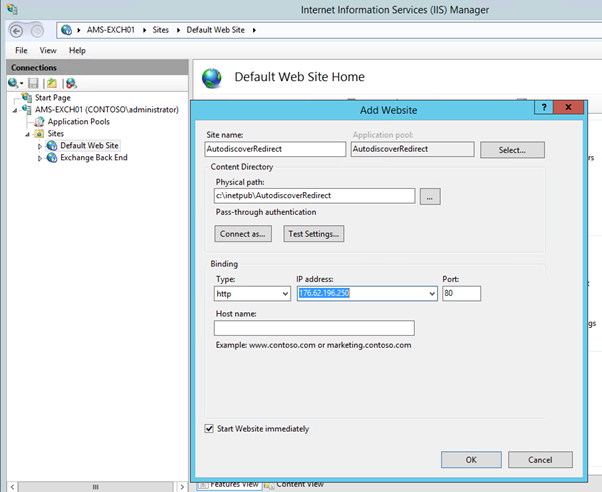 On the Client Access server you have to configure an additional website (in IIS Manager) working with an autodiscoverredirect.contoso.com name. In IIS requests for this website are automatically redirected to the correct autodiscover.contoso.com website/virtual directory. In the Fabrikam namespace you create a CNAME DNS record called autodiscover.fabrikam.com which points to the autodiscoverredirect.contoso.com website. Configure an additional IP address on the Client Access server. 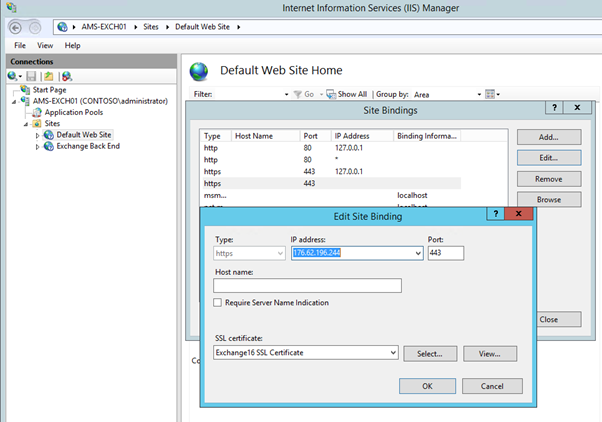 In IIS Manager, bind the Default Web Site to the original IP address of the Client Access server for port 443 as shown in the following figure. Before you continue, make sure the Client Access server keeps working with this new binding. In Windows Explorer create two additional directories C:\Inetpub\AutodiscoverRedirect and C:\Inetpub\AutodiscoverRedirect\Autodiscover. In the AutodiscoverRedirect web site in IIS Manager you’ll see an Autodiscover Virtual Directory show up. Select this Autodiscover Virtual Directory and in the details pane double click HTTP Redirect. The only thing left is to create a DNS record for autodiscoverredirect.exchange16.com which should point to the additional IP address. 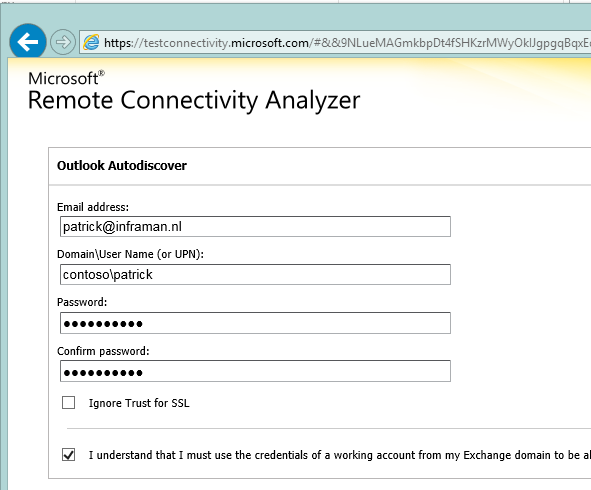 The autodiscover.inframan.nl DNS record should be a CNAME record and point to autodiscoverredirect.exchange16.com. When you expand the HTTP redirect method you can exactly see what’s happening under the hood. You can safely check the Don’t ask me about this website again and Outlook will continue working normally. 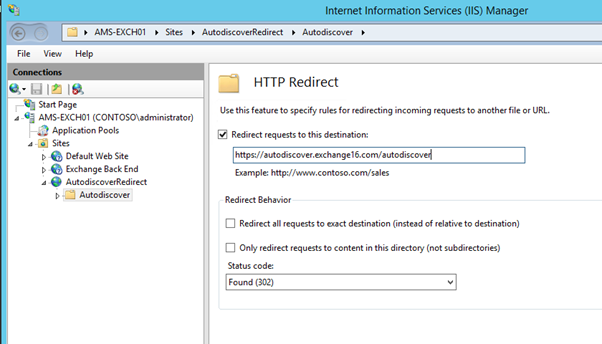 You can use the Autodiscoverredirect option in Exchange 2013 (in this blog on Windows 2012 R2) if you have an Exchange 2013 environment with multiple SMTP domains. You can use these domains without adding these domains to the SSL certificate on the Client Access server. I’ve seen this autodiscoverredirect option at hosting companies where thousands of additional SMTP domains are hosted, but have seen this as enterprise customers as well. And it’s fully supported by Microsoft so you’re good to go. Testing TCP port 80 on host autodiscover.domain.com to ensure it’s listening and open. 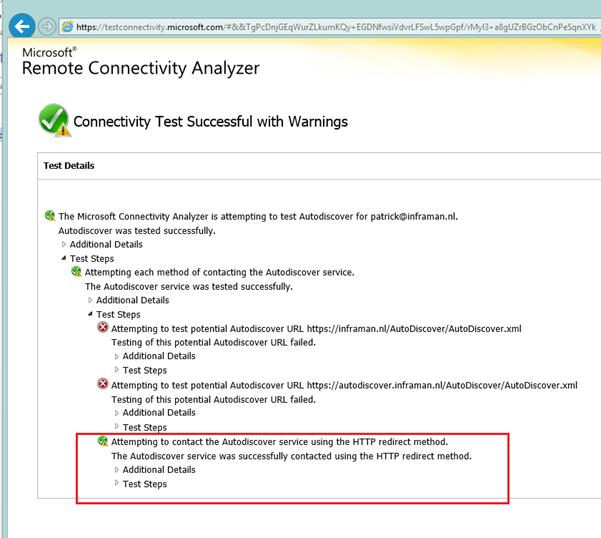 The Microsoft Connectivity Analyzer is checking the host autodiscover.domain.com for an HTTP redirect to the Autodiscover service. Do you seen this behaviour in the Remote Connectivity Analyzer? If I follow these instructions, the Exchange Administrative Center is no longer available on https://localhost/ecp/?ExchClientVer=15. Is it possible to get the EAC working on https://localhost/ecp/?ExchClientVer=15? You have to check the binding to see where 127.0.0.1 lands. you can also use https://servername/ecp. Or even better, implement the redirection site on a different (web) server. New-PSSession: [mail.myserver.com] mail.myserver.com Connecting to remote server failed with the following error message: The WinRM client: HTTP URL not available on the HTTP server to the requested destination. Usually this message is returned by a HTTP server that does not support WS-Management protocol. For more information, see the topic of about_Remote_Troubleshooting Guide. Intead, if I stop the application in IIS, there’s no error. Jaap, latest question: is it possible to make Autodiscover Redirect without setting external DNS records? Good blog entry. Is this possible ONLY create a CNAME ? No, I’m afraid this is not possible. 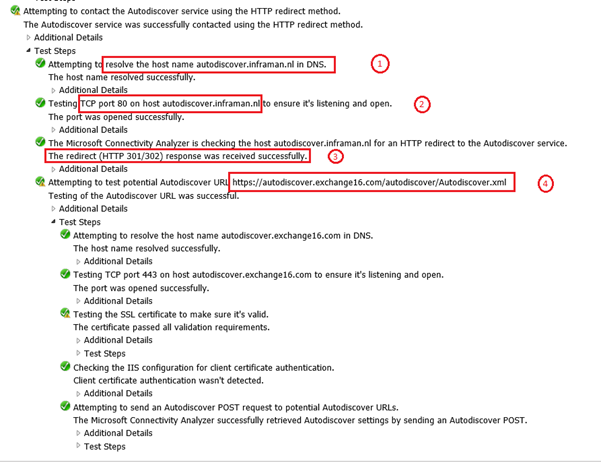 Can I ask why we need an additional IP address for autodiscoverredirect.exchange16.com but not use same ip address with autodiscover.exchange16.com ? My clients will not get a certificate warning but still get a redirect URL warning message right ? If Increasing the number of subject alternative names on the certificate is the best way for my clients won’t get any warning ? You need a seperate website since port 80 is already used by Exchange, and you cannot have to listeners to the same IP address and port. Yes, you will still get the autoredirect warning in Outlook. The best solution is to have multiple names in your SSL certificate as you already mentioned. i followed the instructions as you showed them. But still i get the certificate error. It keeps looking for autodiscover.domainB.com first. Then when i press Yes i get the redirect warning. The only thing I can think about is that your autodiscover.domain.com is pointing to the Client Access server. This should not be the case, autodiscover.domain.com should be a CNAME record pointing to the Autodiscoverredirect website. Well i added a second ip address for the autodiscoverredirect. What would the setup look like if we use host names (host headers) in the binding, with one IP address? Has this stopped working for IPhones/IPads since IOS11? It was working perfectly prior to this. Ok, not a problem, thank you for this information.